If you’d like a sporty subcompact that is built for navigating the urban jungle, then the versatile 2013 Honda Fit is the car for you. This little car has it all, and at Middletown Honda, one of the leading Honda dealers for Goshen, we are thrilled to offer a great selection of these efficient, fun to drive, fully-loaded road warriors. There really isn’t another subcompact that offers the flexible functionality of the Fit, despite all the competition. Just take a look at how it matches up to the Kia Rio. The competition between attractive, zippy, well-rounded subcompacts has increased dramatically in recent years, but the Honda Fit is still the leader of the pack. Featuring an efficient and surprisingly powerful 4-cylinder 1.5L engine, the front wheel drive Fit comes with a standard manual transmission. Known for its remarkable handling, this is a vehicle that is ready to take on any challenge the urban landscape presents. Versatility is the key to the success of Honda’s 4-door hatchback. With a maximum cargo capacity of 57.3 cubic feet, to the Rio’s 49.8 cubic feet, and passenger volume of 90.8 cubic feet, to the 88.4 cubic feet of the Kia, the roomy interior is a pleasant surprise in a car of this size, ensuring you’ll have enough room for friends or storage. With a 5-star front driver crash rating from the National Highway Traffic Safety Administration (the Rio is rated at 4 stars), the Fit is another fine example of the commitment to vehicle safety that Honda is so famous for. 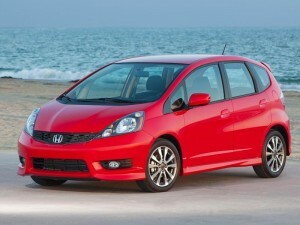 The 2013 Fit is capable, fun, reliable, and has plenty of get-up-and-go. Visit our Goshen area showroom and take one out for a test drive today. We are located at 520 Rt 211 East in Middletown, NY, a quick 9 minute drive form Goshen via NY-17 W. Check out Middletown Honda today, and find out for yourself why we’re recognized as one of Orange County’s preferred Honda dealers.